Props to JarodM for the photos. 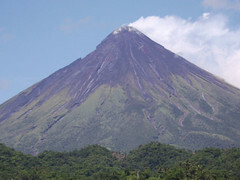 PHIVOLCS 9/23/2006 Mayon update reports weakening seismic activity and decreased lava flow. The Alert Level has been dropped to 3, refugees have been allowed to return to their homes near the volcano, and Mayon generally seems to be calming down. It’s probably a good thing that the eruption consisted mainly of a steady flow lava punctuated only occasionally by relatively weak ash explosions: it most likely means the pressure of magma was relieved slowly, rather than allowed to build up into a major explosive eruption which could have caused much more damage and death. Oh, and that whole “full moon” thing never materialized. 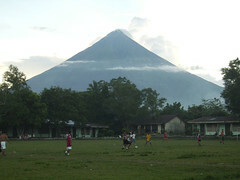 Update: I may have spoken too soon; Mayon has suddenly sprung back to life with new tremors and an ash explosion. Alert Level 3 remains, which means a continued high level of unrest. Interested volcano watchers can keep an eye on the PHIVOLCS “latest activity” log, which shows releases for significant volcanic events.